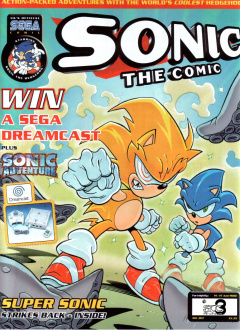 Sonic the Comic #183 is the one-hundred and eighty-third issue of the Sonic the Comic series by Fleetway Editions Ltd. The next part of the story opens with two hooded figures standing on a cliff top looking out at Dr. Robotnik's mountaintop retreat, which is pulsating with Chaos energy. The figures reveal themselves to be Ebony and a dying Super Sonic, who is in desperate need of having his chaos energy reserves recharged. Super Sonic plans to go to the retreat alone, but Ebony refuses, taking the lead. Inside the retreat, Chaos continues to absorb the Chaos Emeralds as Sonic pulls himself together following his return to the present day. Grimer begs for his master to stop Chaos, but Robotnik refuses, telling him that he should be the one to stop the monster as he was the one who released him in the first place. Chaos completes his absorption of the Chaos Emeralds, mutating into the monstrous Perfect Chaos, and proceeds to reshape Mobius into a form more to his liking, starting with Robotnik's retreat. Sonic launches an attack upon Chaos, resisting the creature's fear effect by focusing on his own rage and managing to retrieve a Chaos Emerald, which in turn gives the Freedom Fighters the morale to fight the fear, though it doesn't help much as Chaos no longer needs their fear. Grimer continues to beseech Robotnik into putting a stop to this, only for his master to repeat that he ultimately has no plan, his only intent is for everyone gathered to die here and acknowledging his own insanity. As Sonic battles on, Super Sonic and Ebony join the fray. Ebony tries to convince Sonic that Super Sonic is harmless, but Super Sonic himself states that Sonic will never believe her. Upon realizing that Ebony and Super have come to recharge Super's Chaos energy even though they knew nothing of Chaos, Sonic vows that he would not let his alter-ego near Chaos, not knowing what could happen when he returns to full strength. Unfortunately, Super Sonic quickly hurls himself into the belly of the beast and proceeds to absorb the chaos energy. Data Zone: The Data Zone acts as a quick reference guide to new readers about the characters, providing data files on Sonic, Tails, Knuckles, Dr. Robotnik and Chaos. Graphic Zone: Fan art submitted by readers. The theme for this issue's Graphic Zone is "Movie Madness", featuring Sonic, Tails and Knuckles in various movie poses. Owners of the printed art each won a Sonic the Hedgehog digital watch. A competition to win a Sega Dreamcast and a copy of Sonic Adventure. This page was last edited on 19 March 2019, at 17:14.